An armed woman took a “substantial” amount of cash from a bank vault during a take-over robbery in Lakeview this morning. No one was injured. Sources said the robbery unfolded quickly, with tellers not having enough time to trip hold-up alarms before they were ushered into a back room. A low-quality surveillance image of the suspect was released this afternoon. 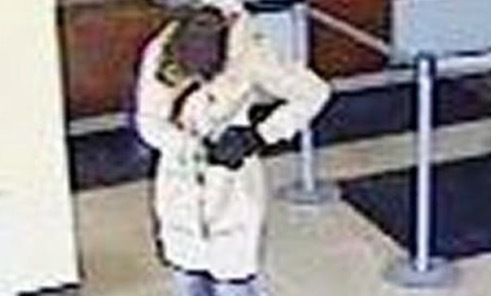 Witnesses describe the robber as a young woman who was trying to appear older. She’s black, about 5’5” tall, thin, in her 20’s and she wore distinctive black lipstick, according to police. Her disguise included an auburn wig with a pink bandana under a black cap; a long tan winter coat; black gloves, blue jeans, a pink nightgown and white shoes. About four hours after the robbery, an FBI-Chicago Police task force arrested a woman at a Chase Bank near Boystown. Officials tonight would not confirm that the arrest was related to this morning’s hold-up.